Yesterday was my 24th birthday! First I would like to give the final update to 23 by twenty-four. I weighed in this morning at 195 pounds; fifteen pounds less than my goal of 210 pounds! I feel great and am very proud of myself! I received my first official birthday present last Friday from my wonderful girlfriend, Amy. She and I had talked about what she wanted to get me for awhile, and I knew she had planned to get me a new wetsuit! 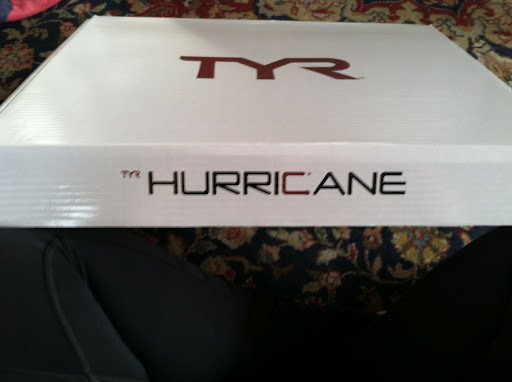 I really like TYR’s Hurricane series, so she had told me she was going to get me the Category 1. We discussed what size I might be, and I thought that was what I was getting. 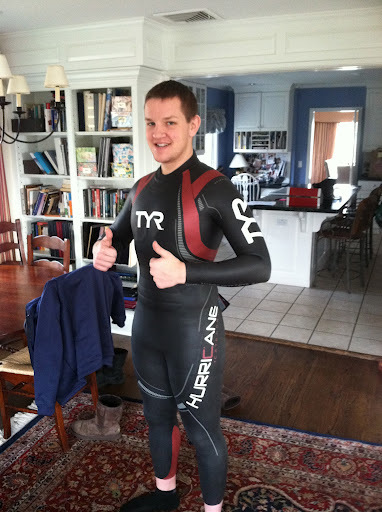 Well, last week, the wetsuit arrived, and Amy couldn’t wait to give it to me just to make sure that it fit properly. To my complete shock and surprise, she got me the Category 5 Hurricane wetsuit! I was so shocked and thankful! 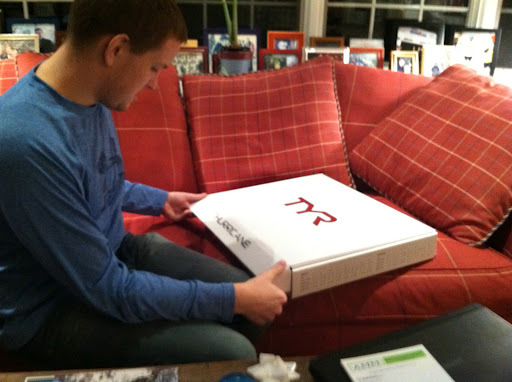 To go along with my new wetsuit, my family got me a TYR transition bag! It hasn’t come yet, but should be here sometime at the beginning of next week! I am very excited to be more organized for Triathlons this year! On my actual birthday, I sat for a new tattoo I had wanted to get for quite awhile. 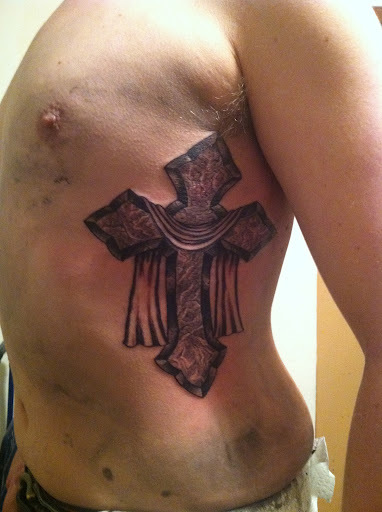 I had always promised myself when I got back to 215 pounds I would get the tattoo, and now that I have I finally got it. I have always wanted a cross with the awareness ribbons for ovarian cancer and ALS (Lou Gherig’s disease). I brought the idea to Ronda Xanthos, the same artist who had done my first tattoo and she drew up a design for me. I just want to say now that I highly highly recommend her, she does great work and always takes the time to make sure everything is perfect! 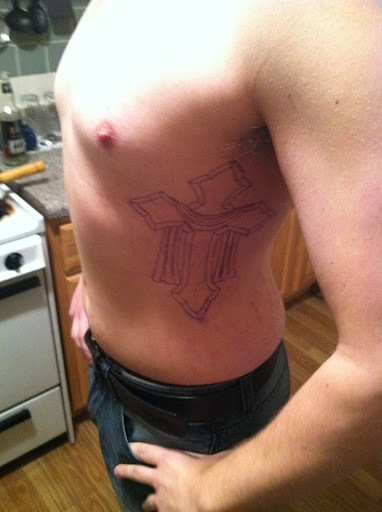 Step 2: All Line work done! 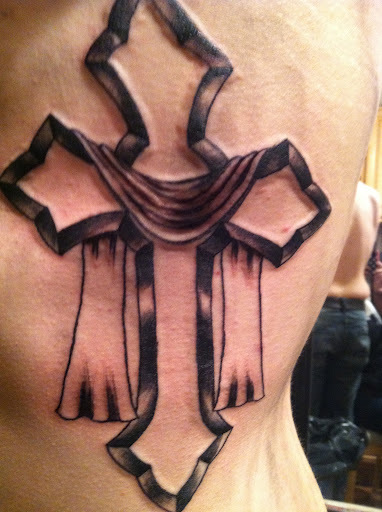 Step 3: Shading of the cross’ edge and draping. Step 5: Shading and coloring to give that true marble look. Marble cross. Only have to put the color on now! Step 6: Coloring the ribbons. 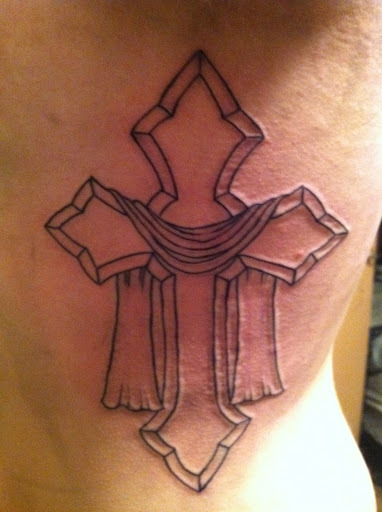 This was the most painful part of the tattoo. I could not be happier with how the piece came out! 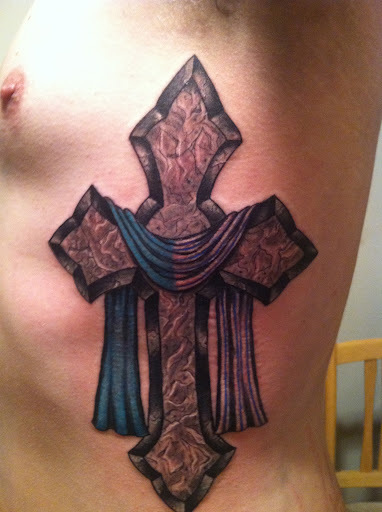 I now will never forget my 24th birthday, just I like will never forget my 18th when I got my first tattoo. I will post pictures of the tattoo after it has healed! Enjoy the Grammys and the work week!